I think you made the right call letting your seam ripper rest, the words and quilting look good one this quilt and all go with the theme! When I read through this, at first I thought you said "I'm 100% happy with the quilting," but then somehow the "not" registered with me, and I thought, "What???" The quilting is really good; in fact, I'm going to pin a pic (with credit, of course) of it to my FMQ Board. But since you asked for feedback, I took a very close look and I can say that I'm not crazy about the diamond with diamonds inside, just because the inner ones start to really collapse in on themselves. However, everything else (the word, the circles down a line, the lightning bolt lines) are fantastic, pat-yourself-on-the-back and take a ride in the TARDIS fantastic. However, I'm also one who almost never spend a whole lot of money per yard on fabric. I wait for sales & good coupons, shop the "red tag" shelves at JoAnn's, and don't mind not having "the latest." It often takes a while before a fabric is used, so it would never stay "the latest" long enough anyway! 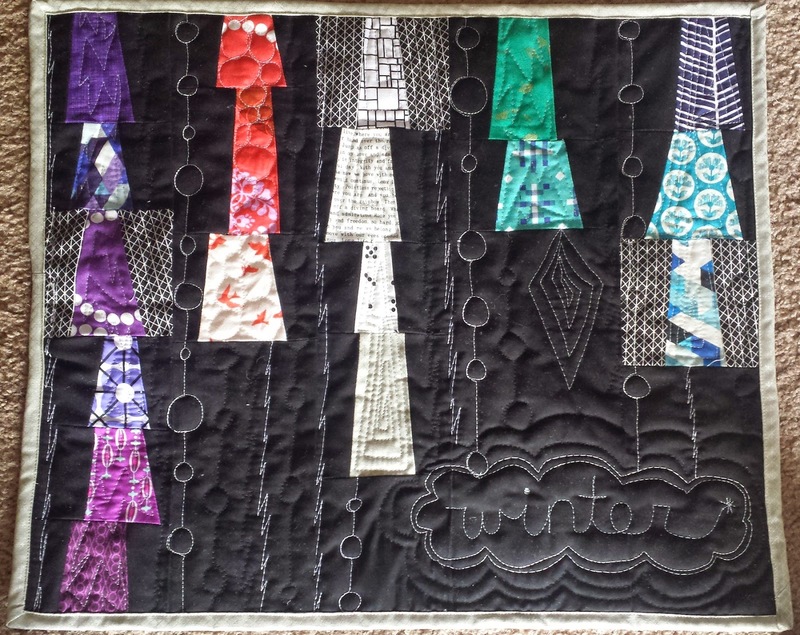 Lovely winter quilt for a not-so-lovely winter (I'm in the Boston area, and we just got a bit more snow, too -- when will it really end?) Great fabric/color choices! I love this! And I love the idea that you are going to make one for each season! Looking forward to seeing what spring brings! 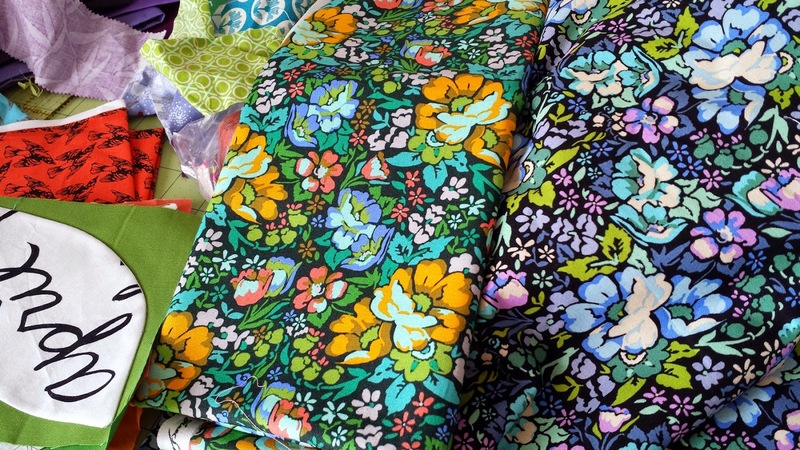 You cannot go wrong with Anna Marie Horner fabric. It is the best. It's lovely! 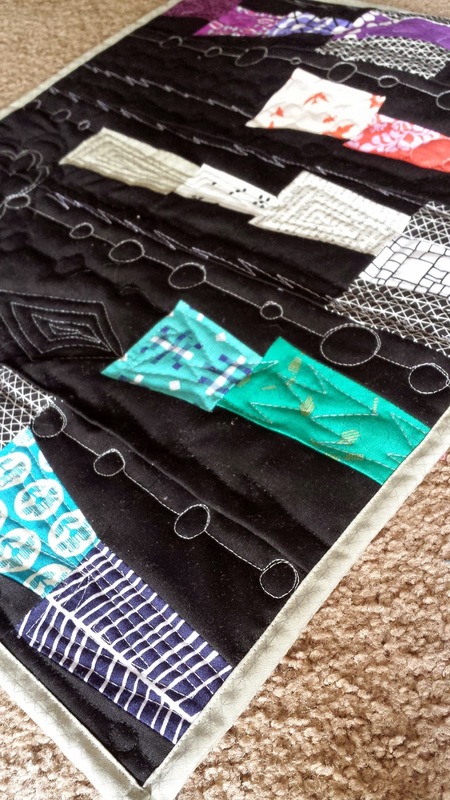 I also like the use of two coloured threads - it adds a layer of interest to the quilt that makes you look twice.